Today was Day #5 of Chocolate, Date and/or Fig Theme Week. Any dessert item that blends figs + chocolate + cream + whiskey (or sherry, or port) is one I'd hasten to try. (Add a pinch or either vanilla or cinnamon, and I might float away into the heavens momentarily.) So, no surprise, I loved these Chocolate Figs from John and Kira's (Philadelphia, PA). 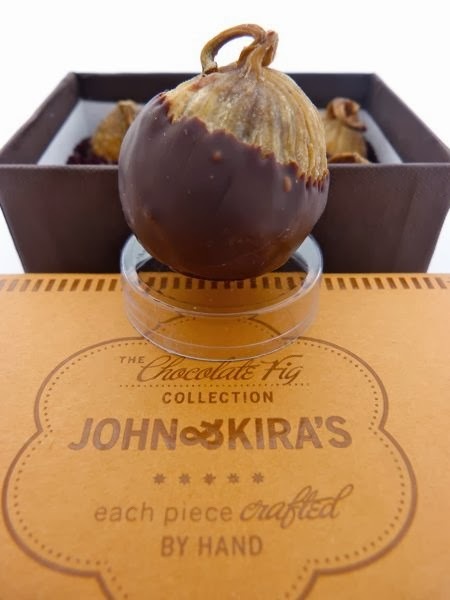 The company started with imported, organic dried Calabacita (little pumpkin) figs from a small family farm in Spain, and filled them with a smooth chocolate, whiskey-infused dark chocolate (Valrhona) ganache (filling). The final step: figs were dipped up to their necks in 62% dark chocolate. Just two of these were surprisingly rich and satisfying and would make a great end-of-meal dessert. These pumpkin shaped chocolate figs also reminded me of all the pumpkins and carved jack-o-lanterns I've been seeing in my neighborhood this week. Tomorrow is Halloween, one of the biggest chocolate holidays of the year in the U.S. Happy Halloween Eve to all. Note: John and Kira's was also selling a box of seasonal chocolate pumpkin caramels this month -- one option was to order a box of these in a coach (reminiscent of Cinderella's enchanted coach that turned into a pumpkin at midnight). Image at left, from John and Kira's website. 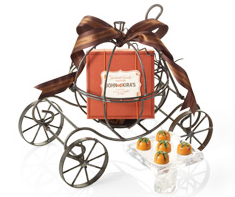 I just received a box of these as a gift -- they are marvelous!